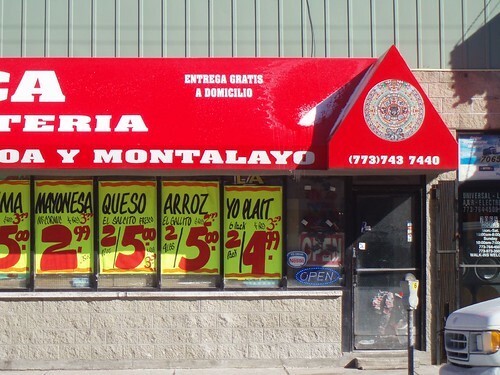 They come in a rainbow of colors (mostly neon, entirely bright), and you can find them all across the city, from Pilsen and Little Village to Logan Square to Rogers Park. 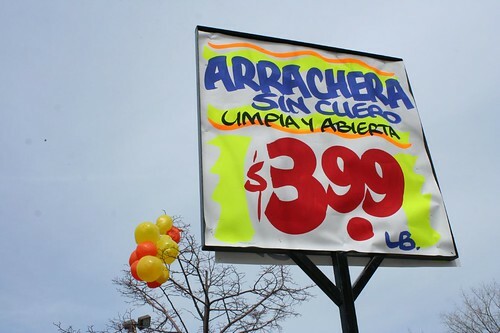 Chicago has tons of Mexican grocers – there are three within a block of my residence alone – and a disproportionate number of them advertise with signs just like these. The style is universal: wavy lines top and bottom, in bright neon colors. Huge blocky numbers for the price, in red. Smaller font for the letters, but still in a bouncy, informal, chipper mood. Like the builder’s Mid-Century style, it’s one of those cases of curious convergence. A quick chat with our local grocer reveals that they get them from varying places, sometimes making them themselves, and sometimes hiring guys to do it. 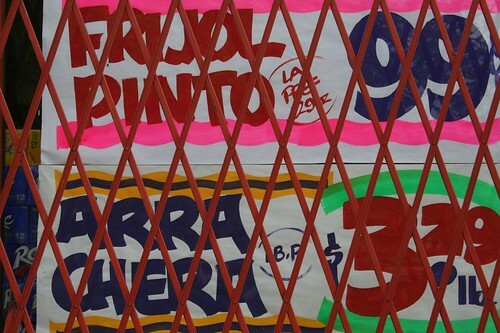 I’ve seen the stamps of at least two different sign makers on these posters, though most of them remain anonymous. Why are they all the same style? Is it demanded, expected, or simply unexamined? Does it relate to some deep cultural strain, or is it just a thing that is? 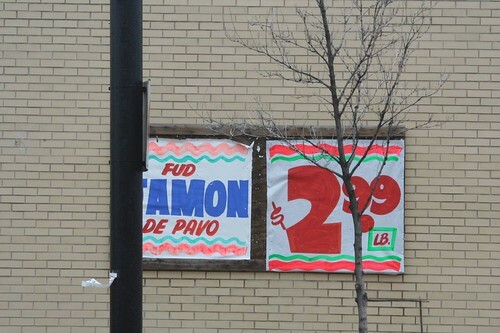 This entry was posted in Commercial strips, modern folk art, One Designer or Many?, Pilsen / Little Village. Bookmark the permalink. 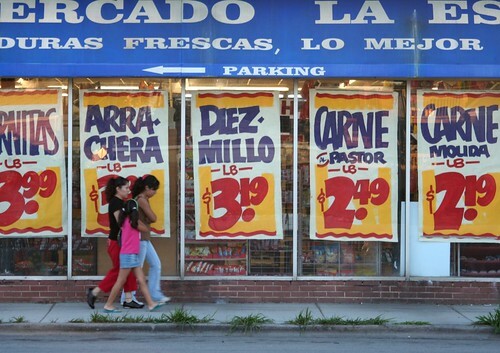 These aren't unique to Mexican grocery stores, in my experience, but rather to street-front grocers and butcher shops all over Chicago. 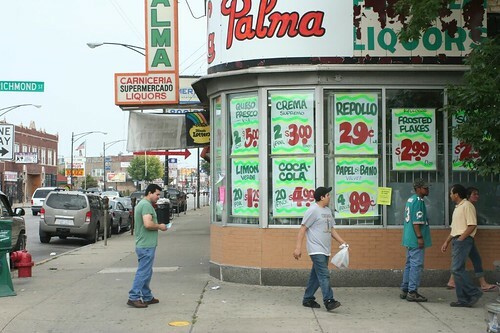 Here's a photo of the Greek-owned Pan's Food Center in Oak Park. 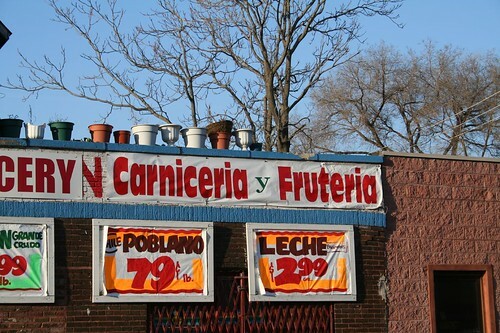 http://www.oakpark.com/News/Articles/10-28-2008/Pan%27s_grocery_store_plans_to_expand Here's a blog post about them. But I do wonder about the fonts. 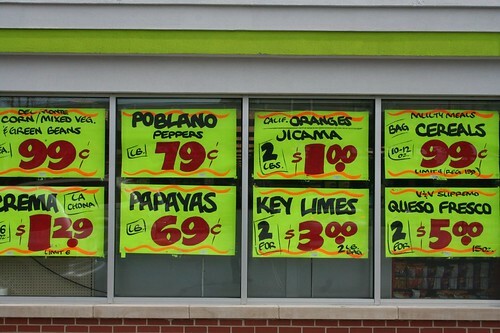 Clearly someone makes a living making these signs. I'm guessing you meant this post?http://www.skyscrapercity.com/showthread.php?t=793162I'll have to keep a closer eye out for where these appear – it's been mostly a Mexican thing from my observations, but that's just me and what I've seen. Thanks for the tip! This was standard at all groceries and butchers back in the 70s, which is as far back as I can go. I'm sure it goes back much further. Jewel(s), etc, probably got rid of them in an attempt to look clean and "modern. "I always was fascinated by them as a kid. How do they make them?